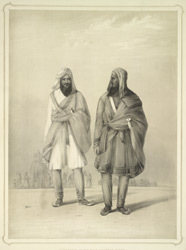 This lithograph is taken from plate 12 of Emily Eden's 'Portraits of the Princes and People of India'. Eden narrated a history of Kharak Singh and the Sikhs: "These figures mark the peculiarity of the appearance of the Sikhs, whose rich and flowing dresses, and tall thin forms, distinguish them strongly from other inhabitants of India. The figures represent attendants of Raja Khurruk Singh, the eldest son of Runjeet Singh, who was deputed on a complimentary mission to the Governor General at Simla. Raja Khurruk Singh succeeded his father, but was too feeble to wield his authority, he soon died, and was succeeded by his son, Nao Nihal Singh, who was shortly afterwards killed by the fall of a gateway. The fall of the family of the great founder of Sikh power was very tragical and striking. Nao nehel [sic] Singh was succeeded by the present Maha-Raja, Shere Singh."